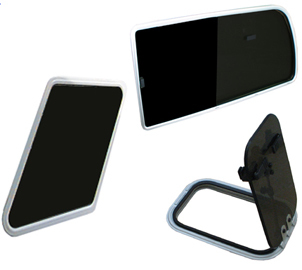 Bomon produces custom windows & hatches for marine, commercal and industrial applications. From windows for one specific replacement application, to meeting the requirements of major boat builders. Please inspect the boats which have our windows installed in the links section. SEE HOW "clamp type" works! Frames are produced from 6063 marine grade aluminum for wall thickness ranging from 0.125" upto 2.625". Bent for following opening radii of 2", 3" and 4" , for hinged windows R=3". Windows are produced with clear, or optional black, anodized finish. Powder coating can be supplied in a variety of colors, however durability of the finish is not guaranteed. Screens can be provided for hinged & sliding windows and are produced for the specific window in which installed. All Bomon windows are warranted to be free from defects of materials and workmanship for a period of 2 years from date of purchase. Bomon, at its discretion, will either repair or replace items covered under this warranty.